Boil the basmati rice & Keep separate to cool down. Keep it in a tray & spread with oil ,so it doesn't stick to each other. Make chilli paste by deseeding the red chillies. In a cup of white vinegar add chilles & allow to boil . Cool down & blend in to make fine paste. Heat oil , add ginger,garlic,onion, chilli paste & followed by all vegetables. Add soy sauce,cooked rice & mix well. Mix well & add chopped spring onion. Garnish with chopped cilantro & serve hot. This sounds delicious and healthy. THxs Ivy for ur quick comment..
wow looks yummy&delicious.. my son's favorite rice.I will try.. thanks for sharing. ooooh! looks so mouth-watering. So colorful. Good one,looks delicious and colorful.. 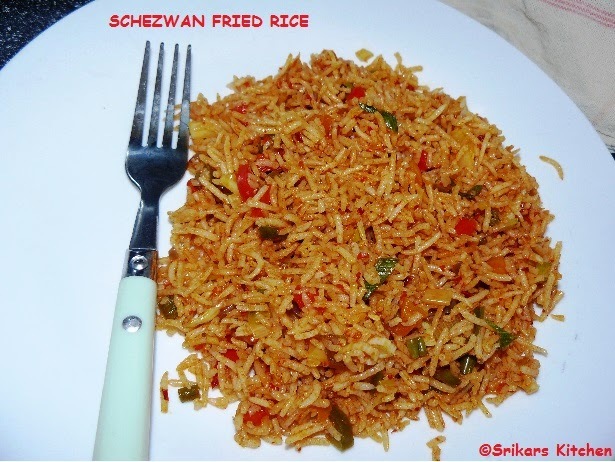 I heard of this fried rice but never tried my hands on this. This recipe looks simple and easy. I will try out this soon. Pic looks gr8. Looks delicious and exotic. I usually make it with the schezwan sauce that is readily available. You have put in a lot of work. Good job! 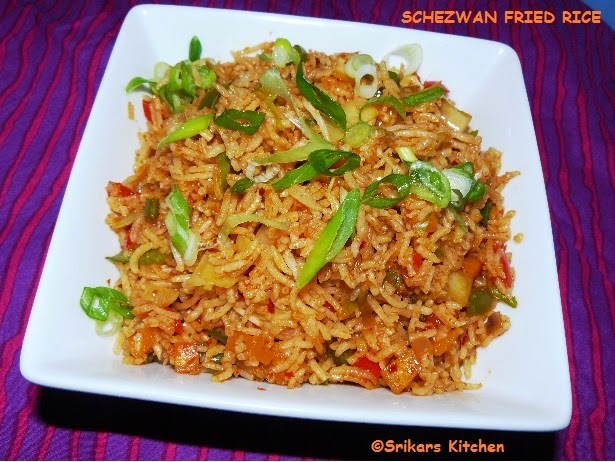 fried rice is quick to make and nice to eat ;) your plate with rice looks so tempting..
Mmmm YUM! That rice looks delish! I always want to make fried rice, I need to keep a good recipe right next to me when I get the craving... Looks awesome! This sounds good. will try it for sure. in most of your receipe the measurement is 1ea. can u pls tell me wat this 'ea' strands for?